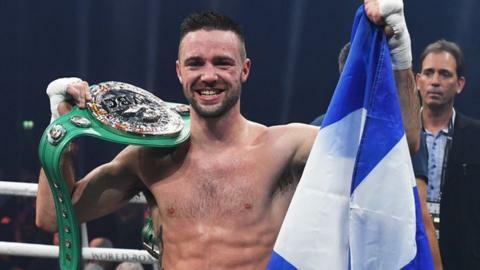 Josh Taylor has told IBF champion Ivan Baranchyk he "can't wait to rip the belt off" him after the latter appeared to confirm their world title fight on 18 May would go ahead. The Belarusian's manager had been quoted as saying the World Boxing Super Series contest at Glasgow's Hydro would not go ahead for financial reasons. But on Wednesday Baranchyk tweeted: "I look forward to fighting Taylor." "I'm glad Baranchyk is coming Glasgow to fight," the Scot, 28, replied. "Can't wait to rip the belt off you and send you homeward to think again." The bout is the semi-final stage of a tournament to decide the new undisputed world super-lightweight champion and there had been reports that Taylor's compatriot, former world champion Ricky Burns, could be a replacement opponent for the Belarusian. However, Taylor's trainer, Shane McGuigan, told Boxing Social that 25-year-old Baranchyk would be stripped of his IBF title if he did not box in Glasgow. Taylor, rated number two in the world, has already knocked out United States' Ryan Martin, while 10th-ranked Baranchyk stopped Sweden's Anthony Yigit. Top-rated American Regis Prograis, the WBC interim champion who defeated Englishman Terry Flanagan in their quarter-final, faces another Belarusian, WBA champion Kiryl Relikh, in the other semi-final.